THE deadly extreme weather and natural disasters that have hit Pakistan, China and Russia in the past two months sound an undeniable warning – we’re rapidly losing a safe climate. In Pakistan, the worst flooding in the state’s history has killed more than 1,200 people, left 20 million homeless and submerged more than one-fifth of the country. The monsoon rains caused flooding and landslides that killed more than 1,400 people in the Chinese province of Gansu on August 8th. The Russian Meteorological Centre said Russia had not gone through a comparable heatwave as that experienced in July/August in 1,000 years. The wildfires and drought will cut Russia’s wheat harvest by one-third this year, which has caused a sharp rise in world grain prices. Global temperature records have been smashed repeatedly this year. Seventeen countries – which combined make up one-fifth of the Earth’s land surface – have reported record-high temperatures so far in 2010. The first half of 2010 was the hottest six-month period on record in the hottest year on record in the hottest decade on record. The human cost of climate change is mounting, with 10million people now affected by hunger as a result of a severe drought in western Africa. The Global Humanitarian Fund estimated in May 2009 that climate change was already causing the deaths of 300,000 people in the global south each year. These unprecedented extreme weather events are happening when the Earth has warmed on average by 0.75°C on pre-industrial levels. In September last year, the British Met Office warned that the planet would warm by a catastrophic 4°C by mid-century if carbon emissions were not immediately cut by at least 3% per year – which would cause millions of people to become climate refugees due to rising sea levels, among other effects. But despite the Kyoto Protocol aiming to achieve an average 5% reduction in global emissions on baseline 1990 levels by 2012, carbon emissions have continued to rise during the 2000s and are now at an all-time high. The Copenhagen climate summit held in December was supposed to agree a legally binding international climate treaty on carbon emission reductions that would replace Kyoto, due to expire in 2012. It fell dismally short of achieving this due to the appalling role played by the United States at the negotiations. The most up-to-date climate science tells us that a 40% cut in emissions in industrialised countries is required by 2020, and an 80-95% cut by 2050. But at Copenhagen, the US pledged only a 4% reduction in its emissions by 2020 – just one-tenth of what climate scientists believe is required! The EU pledged a 20% cut by 2020 – half that required by the science. 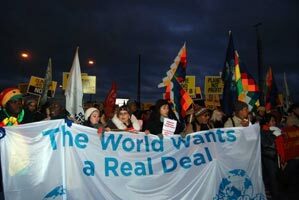 The US has continued to play the role of climate renegade at the negotiations in Bonn this year in the lead-up to the Cop16 summit in Cancún, Mexico, in November – refusing to up its 4% pledge. In the recriminations that followed Copenhagen, western politicians denounced China for throwing a spanner in the works. But what actually happened was that the rich countries, led by the US, tried to force the poor into agreeing to abandon the Kyoto Protocol’s key principles – that targets must be legally binding, that rich countries have a greater responsibility to cut emissions, and that developing countries must be provided with adequate finance for adaptation and mitigation. The outcome of the Copenhagen summit was that 130 countries “took note of” a non-binding accord which contained no actual emission reduction targets. Analysis commissioned by Bolivia and released through the UN at the Bonn climate talks in June showed that countries’ current pledges amounted to just 12% to 18% reductions below 1990 levels by 2020. When all the loopholes and ‘carbon market mechanisms’ in the text were taken into account, global emissions could actually be allowed to rise by 9%! At the June talks in Bonn, more than 100 poor countries demanded that the ‘safe climate target’ of 2°C warming be reduced to 1.5°C or lower. A large body of climate science, including reports from the world’s leading climatologist, NASA’s James Hansen, supports the 1.5°C figure as a safe climate target. The 2°C target is set out in the Copenhagen Accord and arises from the UN’s 2007 IPCC report. The developing countries called for a review of the science, saying the 2007 report has been superseded – but this won’t happen until 2014. The bloc also stated that the Copenhagen Accord’s goal of providing US$100 billion in climate aid annually by 2020 was insufficient. The mainstream media pushes the line that any deal is better than none – that the bloc of poor countries should ‘get real’ and accept the terms being pushed on them. But the laws of physics and chemistry cannot be bargained with, stalled or tricked. The developing alliance between the poor countries, progressive forces in the industrialised states, and the growing global climate justice movement is up against hugely powerful governments and business interests who are determined to prioritise short-term profit over the survival of the planet. Public pressure and mobilisation is clearly the key to changing this balance of forces and ensuring action is taken at Cancún. THE enormous rift between rich and poor countries on solutions to climate change has, unsurprisingly, immediately come to the fore at the UN climate change summit in Copenhagen which began on 7 December and is to conclude on 18 December, reports An Phoblacht’s Emma Clancy from Copenhagen. A secret draft agreement believed to have been worked on by the US and Denmark among other states, which was leaked to the British ‘Guardian’ newspaper on Tuesday 8 December, outlined rich countries’ plans to sideline the UN in all future climate change negotiations. It also sets grossly unequal per capita emissions limits for 2050 that would mean people in rich countries could emit almost twice as much as those in the developing world, and plans to hand climate finance control over from the UN to the unaccountable World Bank. The leaked draft proposals fall dismally short of the action required to tackle climate change and it follows several months of efforts by leading politicians, who represent powerful industrialised states, trying to lower expectations as to what can be achieved at the Copenhagen summit. The industrialised countries are responsible for three quarters of emissions historically while they represent only 15% of the world’s population. The text – a draft of the final agreement – clearly abandons the Kyoto Protocol’s principle that rich and poor countries have differing obligations based on their historical contribution to greenhouse gas emissions and their differing capabilities in terms of making the transition to clean energy. Antonio Hill, climate policy adviser for Oxfam International, said the draft text also “does not suggest anything like the 40% [by 2020] cuts that science is saying is needed”. Sinn Féin MEP Bairbre de Brún, who is participating in the summit as part of the European Parliament’s 15-person official delegation, has reiterated her call for a legally binding treaty to be reached at Copenhagen that sets emissions targets that can limit global warming to no more than 2C. Emissions must peak by 2015 and then be quickly reduced if a safe climate is to be maintained. “Industrialised countries must commit to at least a 40% reduction in greenhouse gas emissions by 2020 and an 80 to 95% reduction by 2050 compared to 1990 levels in order to prevent warming reaching more than 2C,” the MEP said. However, at this stage the EU says it will reduce emissions by just 20% by 2020 (which it will raise to 30% if other states make similar commitments) and by 50% to 80% by 2050. The US pledges to cut emission by only 17% to 20% by 2020. Bairbre de Brún said that in addition to ambitious, science-based targets by industrialised countries, a key element of a just agreement must be the provision of financial and technical aid to developing countries to enable them to put their industries and economies on a sustainable path and to adapt to the impact of climate change. “It has been estimated that the developing world will need €120 billion per year by 2020 to cope with these problems and the EU must commit to at least €30 billion per year in climate funding to developing countries by 2020 in addition to overseas development aid,” de Brún said. The consequence of failure to make the urgent and necessary changes to our societies – to break our fossil fuel addiction and make the transition to sustainable economies powered by renewable energy – is catastrophic climate change. The devastating human cost of climate change that has occurred as a result of the 0.75C warming since pre-industrial temperatures is already being felt in developing countries through drought, floods and other disruptive weather patterns. The Global Humanitarian Fund estimates that 300,000 deaths in the global South are being caused each year by climate change. If warming continues based on current emission rates, the UN estimates that nine out of ten farmers in Africa will be unable to grow food. More than 1.3 billion people in Asia are dependent on water from the rapidly melting Himalayan glaciers to survive; current levels of warming mean the glaciers may have melted entirely by the end of the century. An alliance between the developing countries, progressive forces in the industrialised states and the growing global climate justice movement is facing hugely powerful governments and business interests at the Copenhagen summit that are determined to prioritise short-term profit over the survival of the planet. Public opinion, pressure and mobilisation is the key to changing this balance of forces and ensuring action is taken. The release of hacked email correspondence between climate scientists at the University of East Anglia in mid-November was timed to coincide with the Copenhagen summit and aims to sow seeds of doubt among the public about climate science which proves global warming is occurring and is a result of human activity. The emails are damaging to the climate movement in that they damage the credibility of three or four scientists and show that the highest standards of scientific integrity were not being adhered to in the UAE’s Climate Research Unit. But, as a spokesperson for the British Met office said: “If you look at the emails, there isn’t any evidence that the data was falsified and there’s no evidence that climate change is a hoax”. South African-based author and activist Patrick Bond believes “the real danger comes from fossil fuel firms – especially BP, Shell, Chevron and ExxonMobil – that, like big tobacco corporations decades ago, know full well the lethal potential of their products. Their objective is to place a grain of doubt in our minds, and for that climate denialists are useful,” he said. This denialist campaign is having a disturbing impact, and in the US a poll by Pew Research Center poll in October found that only 35% of respondents believed that human activities lay behind global warming – down from 47% in 2006. The release of the emails has also overshadowed the findings of several highly significant reports that have been released in the past month. In addition to several scientific reports that reaffirm the existing climate science and show that climate change, and specifically the melting of the arctic sea ice, is occurring much faster than believed only two years ago, Friends of the Earth has also released a report outlining the major flaws in the carbon trading system championed by big business and rich governments as a mechanism to reduce emissions. The FoE report – ‘A Dangerous Obsession: The Evidence Against Carbon Trading’ – found that carbon trading is “not delivering the urgent cuts in emissions needed to prevent catastrophic climate change, is failing to realise promised incentives for investment in new low-carbon technology, and is a dangerously unstrategic approach to making the transition to a low-carbon economy”. The report said carbon trading schemes rely on so-called offsetting – “a controversial, ineffective and increasingly discredited mechanism”. The speculative carbon market bubble “risked a repetition of the subprime mortgage crisis, and provide a smokescreen for rich developed countries’ failure to provide developing countries with adequate support to tackle climate change” it said. “A completely different, faster and more strategic approach is needed – one that relies on simple, direct and proven policy tools such as taxation, regulation and public investment,” the report concluded. Hundreds of thousands of people around the world are expected to participate in demonstrations for climate action during the climate change summit, with a global day of action scheduled for 12 December, when a major protest will take place outside the summit in Copenhagen. Last weekend, tens of thousands joined protests in Dublin, Belfast, London, Glasgow, Brussels and Paris to demand an effective treaty that can guarantee a safe climate.